15-12-2-4-6. These figures do not, unfortunately for her fans, correspond to Katarina Witt's mobile telephone number. They instead refer to her stunning list of major titles: fifteen top three finishes, 12 major titles, including two Olympic gold medals, four world titles and six European crowns. After winning the Olympic gold medal at Sarajevo in 1984 "Kati" was literally submerged in a deluge of love letters from around the world. 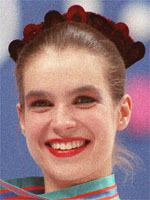 In short, Katarina Witt was dynamite. Several operations on her worn ankle had made it easy for her to follow the advice of her faithful and hugely successful coach, Jutta Muller and bank heavily on artistic flair. Muller's strategy had one aim: seduction. The music she danced to, the flattering costumes she wore, the smile on her face...every last detail was in place. Witt, however, also attracted the interests of the Stasi secret police, who monitored her every move. Yet she was so confident in her talent, her charm and her ability to influence the judges as well as the public that this unwelcome pressure had no visible effect whatever. Indeed, she went on to achieve stunning success. Following her first title in 1983, when she won the European championship, she embarked on a phenomenal winning streak that was only broken by America's Debi Thomas at the 1986 World championships at Geneva. The two rivals met again in Calgary at the 1988 Games, both skaters choosing music from Carmen. The American skater was the more adventurous, but Witt's assurance and overwhelming charm was too much for Thomas, and the East German won her second gold medal. This victory made her the first woman to win consecutive Olympic titles since the legendary Sonja Henie. With a television show ("Carmen on Ice"), consultancy work and Tours, Witt turned professional. Returning to amateur status for the 1994 Lillehammer Games, the tremendous reception she received despite finishing a distant seventh is testimony to her extraordinary and lasting charisma. But the shadow of the East German police continued to haunt her. In May 2002 she gave up a legal battle to prevent the publication of a 181 page Stasi file on her, despite her fears that it would reveal intimate and private details of her life. "The files are like a personal diary for me, and I don't want people to be able to read my life," she said.